> DVD Yokomen-uchi. Basic Practice Methods. 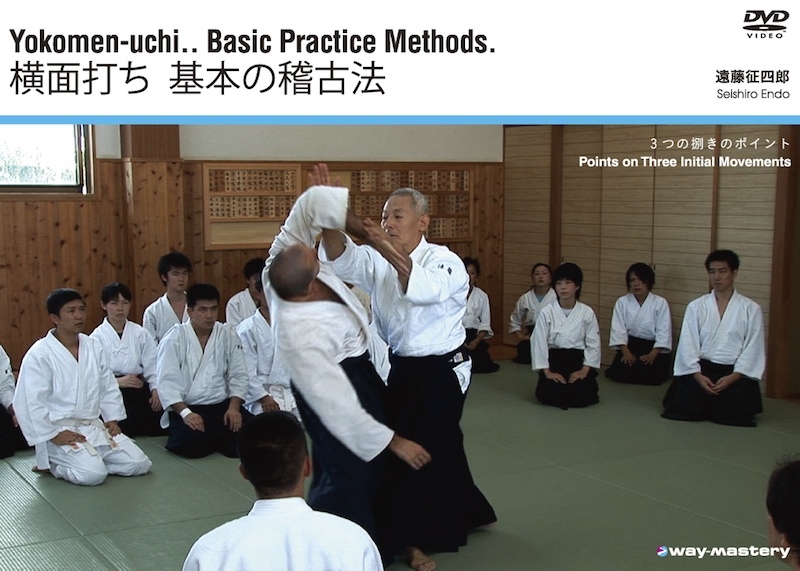 This DVD features Endo shihan's teachings related to yokomen-uchi, starting with how to strike and the importance of striking and responding correctly. Throughout, Endo sensei shares various general and specific technical tips. Specific transitions to techniques are highlighted, also. In many cases, we can see one deal with yokomen-uchi by stopping, then continuing the partner’s movement, making the partner rigid. In Endo sensei’s case, he deals with the strike in a soft way that utilizes the flow of the strike. It is the same for ‘09 Movement using the arm’ which may at first glance seem like it is about stopping the strike. The featured seminar was the 15th Annual Aikido Saku Dojo Summer Seminar of August 2009. "Looking forward to the latest release!" I have most of Endo Shihan's DVDs and I must say the presentation is very good and professional. Also the CONTENT of the DVD is very clear and genuinely deep. I feel that Endo Shihan is lately believing that for the good of modern aikido and of the whole world, he should present his methods and experiences as openly as possible, something which is very strange coming from an Oriental and an Eastern martial art. In today's global village it is vital that genuine knowledge in the ART of O Sensei is conveyed, lest it becomes warped and changed beyond recognition in the near future. So for this I thank Endo Shihan, whom I look forward to be able to meet in the future.